There was yet another disastrous meeting at the Council Chambers last evening during the public meeting held regarding the rezoning of the Don Maynard Park. A resident in the process of delivering his presentation was cut off by the Mayor and told his two minutes were up. His presentation was an effort to make Council aware of the concerns, which he had over the rezoning of the park and the serious impact it was going to have on his property values. 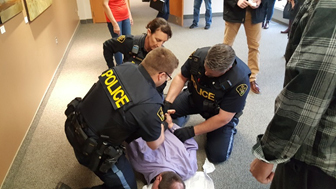 He was forcefully ushered out the Council chambers by the OPP, roughly held face down on the floor, handcuffed and taken to an awaiting police cruiser. His presentation, although it became loud was not abusive, just an outline of his concern with the process. Prior to this incident, the mayor argued with other residents that were planning on speaking to Council, over his two-minute presentation rule (normally when making a presentation a constituent would be given 10 minutes to make a presentation at a public meeting but not this time for some reason), then he closed the meeting. Against all normal rules of procedure, the Mayor announced that the meeting was closed three times. Several persons attending the meeting, who had intended to speak left the building. Public meetings are meant to be established ways for people to express their opinions to Council and in this case, are required to allow the public to speak for or against the amendments to the Community Official Plan and Zoning By-Law that will result in the destruction of 40% of Don Maynard Park. The Mayor and Council once again showed their disrespect to their constituents and once more they showed no intention of listening to the people they serve. The re-zoning of the Don Maynard Park is a major issue for residents of Mississippi Mills and unfortunately, is only one of many issues over which this Mayor and Council are at odds with the residents of Mississippi Mills. For more information on the Pakenham Ramsay Almonte Taxpayers Advocacy Coalition (PRATAC), visit www.pratac.ca.